4. This can be done by using the “node-main” instruction in the package.json file or (in version 0.13 and above) through the Chrome Apps manifest file. Electron does things in a very different way. A main process is started and that main process can open windows with separate renderer processes. This means that communication between windows or between the main process and the renderer processes is a bit harder. A concrete example of that is trying to modify the menus (created in the “main” process) from the code in one of the windows (renderer process). To do that requires data marshalling through IPC communication. Another consequence is that, unlike NW.js, Electron will not automatically quit upon closing the last window. It is up to the developer to listen to window events and quit if wanted. Pretty sure Electron supports native node modules. I’ve written a few myself. Of course it does! It’s probably a copy-paste error when I edited the table. Thanks for pointing it out. I fixed it. Great write up! I tried to run Tint2 but nothing happened on my PC. I posted an issue in their Github. I’ve been using Electron for several months now for my action rpg game. It’s about 100k+ LoC big using Phaser’s Game Engine and CSS/HTML/Nodejs modules for client patching (fs, adm-zip, etc). There is an issue with the RequestAnimationFrame inside libchromiumcontent it’s nothing to do with Electron, but when an app is minimized, the RAF doesn’t update. And for my game being multiplayer and having physics tied to RAF.. this is a must. I’m currently trying to find a way to disable that inside chromium but have no idea. I posted the suggestion here: https://bitbucket.org/chromiumembedded/cef/issues/1864/adding-requestanimationframe-to-disable but it seems like I posted in the wrong area…. so I kind of just give up with it all. Which should make the command –disable-renderer-backgrounding work for RAF as well. I think Cheng Zhao is doing an amazing job and hopefully can patch that in. Because of the differences in architecture, it might not be as easy to do in Electron. Nick, I’m curious about what games you created. I also made a simple action RPG called Nevergrind. I have moved on and I’m currently developing a grand strategy game called Firmament Wars. I have always wanted to create installed versions of these games, but I haven’t attempted to do so quite yet. What kind of stumbling blocks should watch for? How’s the performance? Does anyone know if either electron or nw.js have the ability to render video using the VA-API (Video Acceleration API) to enable hardware accelerated video decode in Linux? Particularly on Intel devices. I know ffmpeg supports this although with a regular chromium browser build and install I had to jump through a few hoops to get this working. Such building it with chromeos support and making sure its not running the the sandbox. Your table above claims that NW supports “App signing” but I haven’t seen that… am I missing something? Thanks for the precisions, Mislav. Keep us posted. Hey App signing works just fine in Electron. If you use electron-builder is really easy to do it, I wouldn’t say this is unclear. Thanks for pointing it out. I’ve updated the chart. Performance hit on electron or nw-js? This is in the NW.js column so it relates to NW.js only. Cheers! 30% sounds like quite a hit for “compiled” code. However, assuming I have interpreted the documentation correctly, if you have anything which is performance orientated (big loops and the like) you can leave that outside of the compiled scripts and have it as a regular JS file. Electron 1.0 has been announced, can you make another update? Unfortunately, I have very little time right now. Hopefully, when I get a little time I will update it. Cheers! Thanks for the great post Jean. I would like to see an update after the Electron 1.0 release too please. NW v0.15 Bombs out of memory in Win7 for undetermined reasons. NW v0.15 Back to old problems with bad drop-shadowing… Chromium is the culprit here I think. NW v13.5 to v0.14 Can’t handle secure sites in iframe – DNS issues and/or bombs out of memory. All NW versions: Cannot get MP3 or MP4 support, can’t add any plugins anyway! Regarding mp3 and mp4 support, there is a page in the NW.js documentation that explains how to do it. Is the procedure described not working? I can’t understand Chinese-English so that page is useless to me and to this day I honestly don’t know of *anyone* who has managed MP3/MP4 support in Windows under NW. Btw, I think you should remove the “MP3/MP4 support with some effort” for NW because one could argue that with “some effort” one can build a jumbo jet or an aircraft carrier so “some effort” is meaningless and misleading. The truth is that NW *DOES NOT* natively support MP3/MP4 (I suspect because there’s no such thing as a PPAPI MP3/MP4 plugin so far, but only in NPAPI format which Chromium threw out the pram along with its nappies) and I challenge anyone out there to prove me wrong by pointing us to a recent NW Chromium project that handles MP3/MP4s internally. Please make my day by proving me wrong. Thanks! I PRAY that it’s possible because I have a beautiful browser on hold that simply cannot compete with the competition if it can’t even handle MP3/MP4s! Far out! It *DOES* work when you replace the stock ffmpeg.dll with the one on the link you were given! They’ve been hiding that page from us for years! Not a mention of that link from NW!!! However, it doesn’t register as a plugin or a MIME type of any kind, so I have no idea how this works but I’m not complaining and I don’t care how it works! PS: Don’t ever lose that link! I’m glad it worked out. It should definitely be added to the documentation. I modified my chart to more accurately reflect reality. Be sure to thank that guy for his great link when you find the time, and please also ask in that thread how we can get WebGL support in NW. The default WebGL status in NW returns “Supported but disabled” and I’ve no idea how to get that to work, if at all possible. Thanks. Yep, I did thank him. Regarding WebGL support, I invite you to do as I did and ask your question on the NW.js Google Group. Another option is to try asking on Gitter. Surely, someone will be able to help. I would but I can’t have a Google account. As for Gitter… looks rather chaotic. I’ve sent him an email…if I get a solution I’ll post it here so you can add it to your list. Did you try the procedure described in the documentation? Crosswalk is very interesting. However, this is an article about creating desktop applications. With no support for Mac OS X, Crosswalk pretty much disqualifies itself. Check out the NW.js documentation for pointers on app distribution. For Node.js, grab a book or one of the countless tutorials available on YouTube. Great comparison, thanks for keeping up to date! The NW.js column mentions Windows XP+ support, but since Node 6 no longer supports XP, does that still stand? The LTS (long term support) version (0.14.x) is scheduled to be supported all the way through somewhere in 2018. As stated in the release notes, this version will stick with Chromium v50.x and Node v5.x. This means we will still have official Windows XP support for two more years. Obviously, you cannot use the newer 0.15+ versions on Windows XP. I was siding with electron for the last year but recently NW.js has come out on top for me. The chrome. * API’s mean I now have reliable serial port comms without native node modules (which have been unreliable at best) and can even support bluetoothLE on chromebooks. Native serial support is the reason why I’m using it for physical computing projects. It makes it so much easier to connect to microcontrollers such as the Arduino than using native-based Node modules. The new WebUSB API might make all this even easier though. NW.js has been ported to arm. Thanks for pointing it out. 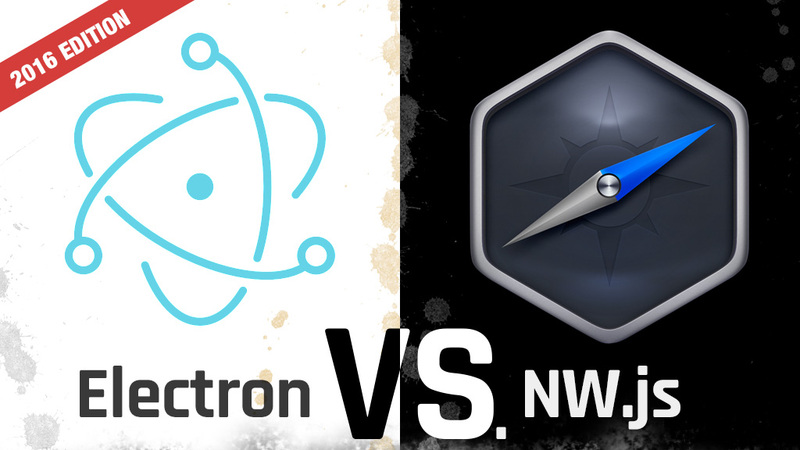 As far as I can tell, Electron and NW.js have about the same arm support now. Electron project inception in 2014?, isn’t it 2013? Hmmm… I don’t recall why I came up with 2014 as the inception date. The first release of “Atom Shell” came out in July 2013. The first release of “Electron” actually came out in April of 2015. But, in all fairness, I guess you are right. The project changed name but it’s still the same project. I’ll update the chart to say 2013. Will there be an update for 2017? I recently converted our large app from nw.js to electron. The last two are key. We can build and package on any platform from a single CLI command and spectron gives you so many more options than simply using webdriver. Also, asar makes installation so much quicker. On Windows the installer only has to copy the single asar file whereas for nw.js if you don’t want the performance impact of snapshots, it had to copy many, many tens of thousands of tiny files which took forever. Thanks for this very valuable input! In the second paragraph under the heading “Paradigm” you start out talking about Electron then move into NW.js. It’s very confusing especially as the third paragraph then seems to go back to Electron! ???? Other than that it seems a very good article. Electron issues are now up to 4d to resolve and 7% open. Also the link to isitmaintained for Electron is broken. It should be http://isitmaintained.com/project/Electron/electron. I am considering using nwjs as a replacement for when I would have used Adobe Air. Would you be able to comment on nwjs performance and stability as a touchscreen kiosk when compared to Air? It would use basic animations, sliding, fading, etc and possibly have a need to scroll text by touch & drag. As well as download and cache files. Thanks for any input you may have! I would like to hear this also, is it good as Adobe AIR? My experience so far is that it is not as tightly integrated as Adobe AIR but you can still manage to do everything AIR does. In fact, there are much more libraries and tools for the web platform (front end + Node) than there are for AIR. As far as I know, NW.js is very stable for kiosk use. I used it to run a CreateJS-based project (with StageGL) and performance was great. Electron 1.6.8 and Nw.js 4.2 has been announced now, can you make another update? I do not know which one is better suited to myself. Navigation is an issue on electron. Can you be more specific about the navigation issues? I’m looking forward to 2018 version.